Are American Forces In Danger of Bloody Defeat In Iraq On A Scale of Waterloo? Title: Are American Forces In Danger of Bloody Defeat In Iraq On A Scale of "Waterloo"? Subtitle: "Evidence on the ground" suggests that Iraqi Insurgents, led by Iran, may be about ready to cut vulnerable supply lines from Kuwait to Baghdad, thus denying American forces basic supplies of fuel and ammunition needed to fight effectively. As Coalition Forces -- led by Americans and British -- attacked across the Iraqi border on March 20, 2003, Iran sent ambassadors to virtually all Arab capitols in the Middle East. These ambassadors laid out a detailed plan as to how Iran planned to defeat the invading forces. We reported on this plan in NEWS1910, entitled, "HAS IRAN 'IGNITED MANY FIRES' TO SET OFF MIDDLE EAST REGIONAL WAR?". Iran planned to bog down the United States in a guerilla warfare in Iraq, believing that Iraq was a "swamp" into which Coalition Forces would sink. Then, once Coalition Powers were enmeshed in Iraq, Iran planned to "light many fires" of conflict in and around Iraq, including Israel. Israeli Defense Force (IDF) intelligence believes that Iran was the major power who engineered the success of Hezbollah against the IDF in the latest Lebanon War. Further, there is evidence that Hamas is receiving monies, military supplies, and advice from Iranian officials as they battle against both Israel and the United States. Inside Iraq, Bush Administration officials have repeatedly accused Iran of indirectly intervening in the Iraq War - supplying military supplies, training and a master political plan. Even Iranian special forces have been spotted mixing in amongst the Iraqi insurgents. I have not seen any figures as to how many such Iranian special forces troops have been infiltrated into Iraq. However, this much is certain: at the right moment in this Iraq conflict, these Iranian special forces are going to spring into action against American forces in a classic guerilla hit-an-run attack. Their training, their tactics and their weaponry may prove devastating against an American force who is already stretched too thin and who is tired and discouraged. "Amateurs talk strategy; professionals talk logistics." -- Gen. Omar Bradley, Washington, DC. Rarely have I seen such military wisdom, so succinctly stated! My best friend in high school served in the US Army officer corps in Logistics. His job was to plan how to move forces from one place to another. Some of these exercises involved moving entire armies across the globe. His department had to figure how many trucks, Humvees, helicopters, air transport aircraft, etc., to move the mountain of equipment and supplies which this force needed. This friend took his job very seriously because wars have been won and/or lost because of logistic considerations. This story is about how Iran seems poised to attack America's superior army through her glaring weakness -- logistical re supply. Please read this story carefully, for it rings true to both the training I received in US Army Intelligence and to the Daily News I have been recording every single day since this conflict began. Let us begin this sad tale. 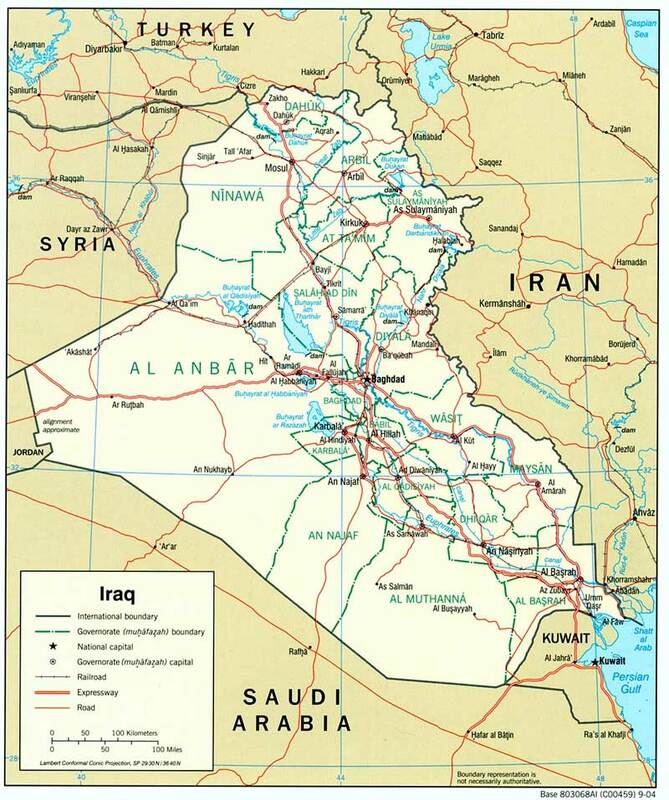 As we recount the statistics, keep referring to the Iraq map we have provided. Before going any further, please take this opportunity to read the details of each of these battles; only then can you envision the enormity of the bloodshed and defeat which Mr. Tarpley fears America is about to suffer. Each of these battles sealed the fate of the Empire, so we can understand Mr. Tarpley's belief that the American Empire, i.e., the supremacy of the American nation, may be ended by a battle of this magnitude. These are strong statements, but ones seemingly backed up by the evidence on the ground. "US forces attempting to defend a zone of occupation deep within landlocked Iraq now face an extraordinarily critical situation. These forces are wholly dependent on a supply line based on two roads on either side of the Euphrates which stretch some 400 miles (about 650 km) from Kuwait north towards Baghdad. It is along these roads that gasoline, food, ammunition, and all other sinews of war must be transported by truck convoy. Two roads of 400 miles each add up to 800 miles of highway to defend ­ an impossible proposition in the face of a sustained people's war by the Shiites of the lower Euphrates." The Shi'ites are the religious party which comprises the majority in Iran. Take a close look at this map, and you will see the two roads running roughly parallel to the Euphrates River. One seems to be a major road, while the other seems to be just a normal, everyday road. In the past three years, the insurgent improvised roadside bomb has been responsible for the majority of American military deaths in Iraq. Day after day, truck convoys would suffer bombings from a roadside bomb planted at random along the road on which the American re supply. convoys had to travel. In fact, I believe I remember that an American G.I. refused orders about two years ago to drive his truck anymore, because the convoys were not receiving military protection, which means they were "sitting ducks" to the insurgents. Nothing much has changed, and the time may be getting close where Iran is going to kick a guerilla-style attack into high gear against the American logistically supply lines. If you can choke off vital re supply., like food, gasoline, and munitions, you can doom a technologically superior army. I wonder if the devastating attack (October 10-11) on the Camp Falcon munitions and supply base within the Green Zone represented the first blow in this slowly developing campaign? An awful lot of munitions and gasoline supplies were destroyed that night. As of this moment, I am not familiar with the logistics as to whether those supplies have been replaced. My gut instinct is that they have not all been replaced, thus placing American forces at even greater risk, for the supplies of Camp Falcon had already been delivered and were close at hand for the American army; these supplies had already run the gauntlet which these two supply roads represent. Now, let us return to this article, and you will see the hand of the professionally-led Iranian special forces operating behind the scenes. "The Iraqi resistance understood early on that these truck convoys represented a grave vulnerability for the occupation forces, and this has been the key to their most effective weapon so far, the improvised roadside bomb or IED. This vital aorta of supplies could now be cut in several places at once by the Shiite guerrillas of the Mahdi army or related groups." At this point, you might ask how Coalition Forces have moved supplies on these roads thus far without suffering grievous losses. The answer is simple: the "Coalition of the Willing"
"Originally, this area was supposed to be guarded by a multinational force drawn from Bush's so-called 'coalition of the willing'. But, almost unnoticed in the US, the 'coalition of the willing' has disintegrated and vanished from the scene, leaving a dangerous void. " At this point, Mr. Tarpley lists the number of foreign troops from this Coalition who have been protecting this vital 800 miles of roadway. Notice THAT the total number of troops roughly equals the number of additional troops which the Bush Administration wants to "surge" into Iraq. These are the soldiers from this "coalition of the willing" who have been protecting these 2 convoy roads. Total number of "Coalition of the Willing" forces which are in the process of pulling out: 16,956 troops. Of course, this number is very close to the 20,000+ American troops President Bush wants to temporarily "surge" into Iraq; are these troops going to take over the protection of these 800 miles of convoy roads? It certainly is a possibility. If the Democrats successfully block The Pentagon from sending in these additional forces, these convoy roads are going to be in grave danger. In fact, the insurgents can cut them at will, and could mount a sustained guerilla war offensive which would cut these roads in various places at various times. American forces could run dry of gas and out of ammunition very quickly. But, what about the British troops hanging on to the restive city of Basra, in southern Iraq? "That leaves 7,200 British forces, the remnant of a larger force which the British had fielded for the 2003 invasion. British Defense Secretary Des Browne and Foreign Secretary Margaret Beckett said in late November 2006 that the UK contingent would hand security control over to the Iraqis in the province of Maysan on the Iranian border in January, and then hand over security responsibility in the southern port city of Basra by the spring of 2007. " In posting thousands of news stories since the March 20, 2003, invasion, I can tell you that the British are very unhappy with the way in which events have unfolded in Basra. Their hold on this city is tenuous at best. By Spring, 2007, the inept Iraqi forces will be charged with security in the entire region - all the way along the winding Iranian border to the port city of Basra itself. I wonder if the Iraqi police and army will fold as quickly as did the South Vietnamese forces once the North Vietnamese attacked? Now, let us get into more specifics as to how this plan might spring into action. "... the most vital logistical link for the US forces stretches for 400 miles through regions now in the process of being deserted by the former allies and coalition partners. This area is very large, and there are no US land forces are available anywhere to maintain a semblance of security. This adds up to a finding that the US position in central Iraq is simply untenable, now that the 'coalition of the willing' has melted away. This fact must be faced, and a US pullout begun at once, before this massive danger turns into a catastrophic rout." Of course, President Bush does not publicly believe this scenario could happen, so he is still talking glibly about "winning", and about "victory". "Are there any alternatives to this 400 mile double gauntlet from Kuwait to Baghdad? If there were alternatives, the US forces might shift their base ... But there are no alternatives to the Kuwait-Baghdad roads. The road from Amman, Jordan to Baghdad passes through Anbar province, where the position of the US Marines is desperate and the power of the Baathist-Sunni national resistance is growing. Turkey, angered by the US sponsorship of PKK terrorists which are supposed to attack Iran but also attack Turkey, shows no sign of offering alternative supply lines. In any case, the roads coming into Baghdad from the west, north, and northeast through places like Tikrit and Baquba are subject to constant attack by the Baathist-Sunni resistance. No alternative supply lines could come through these regions." Indeed, another news story offers a glimpse into the chaotic world of Baghdad and its environs. "Sunni insurgents have cut the roads linking the city to the rest of Iraq. The country is being partitioned as militiamen fight bloody battles for control of towns and villages north and south of the capital ... Well-armed Sunni tribes now largely surround Baghdad and are fighting Shia militias to complete the encirclement. The Sunni insurgents seem to be following a plan to control all the approaches to Baghdad. They have long held the highway leading west to the Jordanian border and east into Diyala province. 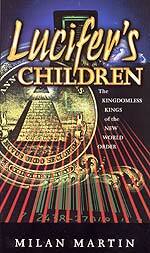 Now they seem to be systematically taking over routes leading north and south." "In some isolated neighbourhoods in Baghdad, food shortages are becoming severe. Shops are open for only a few hours a day ... The city itself has broken up into a dozen or more hostile districts ... The scale of killing is already as bad as Bosnia at the height of the Balkans conflict. An apocalyptic scenario could well emerge - with slaughter on a massive scale. As America prepares its exit strategy, the fear in Iraq is of a genocidal conflict between the Sunni minority and the Shias in which an entire society implodes." "In reality the militias are growing stronger by the day because the Shia and Sunni communities feel threatened and do not trust the army and police to defend them .. The impotence of US forces to prevent civil war is underlined by the fact that the intense fighting between Sunni and Shia around Balad, north of Baghdad, has raged for a month, although the town is beside one of Iraq's largest American bases." With Sunni militias controlling all roads leading into and out of Baghdad, and with Shi-ite militias largely controlling inner Baghdad, the scene is set for a huge explosion of civil war violence, with American forces unable to control the situation. If Iranian troops massed on the Iraqi border intervene to stop a massacre of Shi-ite forces in Baghdad, all-out war could erupt, with American and British forces caught in the middle. Now, let us go back to the original Tarpley news story. "Normally it would be virtually impossible for the US military machine to be destroyed in place. Indeed, it is unlikely that Iraqi resistance fighters could defeat US forces in pitched battle in the open field. But this is not necessary for the US to be defeated in this way. If US gasoline and ammunition supplies were cut off, US force protection capabilities would be severely undermined. Some supplies might be brought in by air, but this could not be sustained for very long, especially because the surface to air missile capabilities of the resistance are improving. The US forces in central Iraq might improvise a Chosun reservoir-style fighting retreat towards Kuwait, but here again losses would be extravagant, and much equipment would have to be abandoned." "In technical terms, the Mahdi Army would need to deploy its forces in a series of well prepared defensive hedgehog positions along the two critical roads from Kuwait to Baghdad, possibly supplementing this with other hedgehogs blocking the exits from the remaining British and multinational bases in southern Iraq. These would be positions modeled on the Hezbollah defensive hedgehogs in southern Lebanon which gave such a good account of themselves against the attempted incursions by the Israeli Defense Force during the August 2006 war." If this scenario unfolds in just a portion of the manner in which it is here described, American forces could be annihilated simply because they have run out of gasoline and munitions. That is exactly what happened to brave American Marines in Mogadishu, Africa. They were captured and killed simply and only because they had run out of munitions. This time, 150,000 American troops could find themselves in exactly this horrific situation. "They should compare withdrawal, not with the unattainable illusion of military victory (even at considerable cost), but rather with the decimation or even annihilation of the US expeditionary force in Iraq ... This would be a US disaster of incalculable proportions ... it may only be a question of time until the Baathist-Sunni national resistance and the Mahdi Army converge on a campaign to expel foreign occupation forces by attacking their most obvious weakness: truck convoy logistics between Kuwait and Baghdad ... When the Israeli army broke its sword against the Hezbollah lines in southern Lebanon this past summer, the death knell sounded for the US-UK model of imperialism in the Middle East." 1) This disaster scenario could not happen unless the Illuminized government of President Bush is complicit. Remember, we have been focusing on the discrediting campaign of the President since February, 2004 (NEWS1929). Certainly, such a discrediting campaign would be finalized with a huge bang if American forces are decimated on the fields of Iraq. 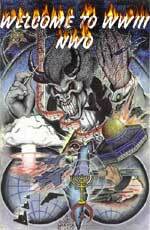 Discrediting the President is a part of the Illuminati Plan as President Bush is well aware, and is fully complicit. 2) We have also been talking about the deliberate Illuminati campaign called "Blood In The Streets", where an inferior army is either provoked or encouraged to attack a vastly superior army. Arabs all over the world were very encouraged by the lack of victory the IDF suffered in its war in Lebanon. Were American forces to be decimated in Iraq, Arabs would believe they would have nothing at all to fear from Western Forces. 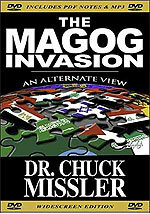 The swarms of armies foretold in Zechariah 12 coming against Jerusalem could become reality. God Himself will destroy these hordes attacking His Jerusalem. 3) This kind of scenario seems to have been planned by Russia and Iran before the invasion of Iraq. This reality means that American forces are facing the most professional of enemy -- the Russian special forces. I was startled to hear Iraqi Insurgents giving American forces 30 days in which to retreat out of Iraq, leaving behind their heavy equipment. Is this demand a first sign that this decimation is about to begin? "BAGHDAD, Iraq (CNN) -- The leader of an umbrella organization for Iraqi insurgent groups is offering the United States a one-month truce to withdraw all U.S. forces from Iraq and turn over its military bases 'to the mujahedeen of the Islamic state'. In an audiotape posted on Islamic Web sites Friday, a speaker identified as Abu Omar al-Baghdadi, the leader of the Mujahideen Shura Council, said that if U.S. forces begin withdrawing from Iraq immediately and leave their heavy weaponry behind, "we will allow your withdrawal to complete without anyone targeting you with any explosive or anything else." " 'We say to Bush not to waste this historic opportunity that will guarantee you a safe withdrawal', al-Baghdadi said on the audiotape." The arrogance of this statement is breathtaking! Only the victorious side in a conflict can issue a statement like this. The Iraqi insurgency is declaring to the world that the war is effectively over, and they have beaten the Americans -- "end of the story". Now, the insurgency is "offering" President Bush a way out of Iraq which will prevent a slaughter of American troops. That is "chutzpah", my friend. Pure and unadulterated "chutzpah". Has America lost this war this completely? President Bush last week actually said, "We are not winning", but surely that does not mean that the situation is so hopeless that Coalition Forces must withdraw under these demeaning circumstances. Or, is the situation on the ground a lot worse than we have been lead to believe? Indeed, it does mean exactly that. This surprising demand may be the insurgent's opening salvo against American forces, in a war we have just described, above. The End of the Age is truly hurtling toward us. The forces of the world have been drawn into the Middle East, just as Joel 3 foretold 2,500 years ago. Are you spiritually ready? Is your family? Are you adequately protecting your loved ones? This is the reason for this ministry, to enable you to first understand the peril facing you, and then help you develop strategies to warn and protect your loved ones. Once you have been thoroughly trained, you can also use your knowledge as a means to open the door of discussion with an unsaved person. I have been able to use it many times, and have seen people come to Jesus Christ as a result. These perilous times are also a time when we can reach many souls for Jesus Christ, making an eternal difference.